MANILA, Philippines – As a young republic, the Philippines has held almost 50 general elections since 1898. What do we know? The oldest senatorial candidate in this year’s elections, United Nationalist Alliance’s Ernesto Maceda, has witnessed more than half of those polls – 33 to be exact. Maceda, 78, was born a few months before Manuel Quezon became Philippine president. A couple of months later, Samson Alcantara – another candidate this year under the Social Justice Society – was born. When Maceda graduated from college in 1952, the pilot telecast of DZAQ TV, later on ABS-CBN, aired a year after. On the other hand, the youngest candidate – former Manila City councilor Greco Belgica, 35 – was born almost a month before the longest-running show in the country, Eat Bulaga, aired its first episode. He, along with the other 4 candidates, were born just when the country was placed under Martial Law. 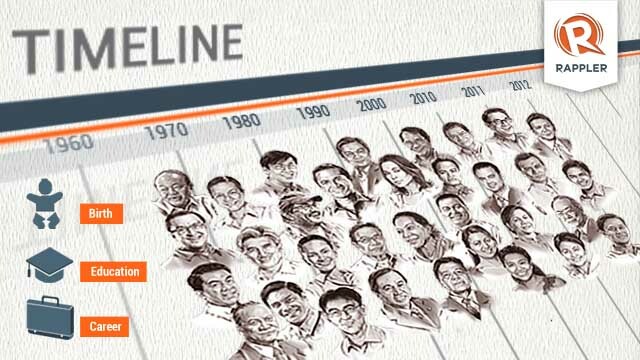 Rappler has come up with this interactive timeline of historical and social milestones, from which you can generate a number of such interesting trivia about the 2013 senatorial candidates. When the country was attacked by the Japanese during World War II, 4 senatorial candidates were already alive. Three more were born just before the Japanese forces surrendered to the Americans. The term “communism” is often associated today with candidates Risa Hontiveros and Teddy Casiño. Coincidentally, the New People's Army was established 4 months after Casiño was born, and 3 years after Hontiveros was born. Twenty-two out of the 33 candidates were born in Metro Manila, which was only created in 1975 with the merging of Manila and Rizal. These candidates declared either “Manila” or “Rizal” as birthplace in their certificates of candidacy. Fourteen of the youngest candidates finished college after the Edsa Revolution in 1986.